A great starter for any campfire meal! Place trout in a glass cooking dish and cover with cure. Make sure all surfaces of the fish come in contact with the cure. Refrigerate for 1 hour. Mix ricotta, mustard, lemon zest and dill in a small bowl. Season with salt and pepper. Remove salt cure from the trout. Rinse under cold water and pat dry. Brush maple syrup over trout fillets. Make a pocket with the tin foil. Add soaked wood chips and close. Puncture holes in the tinfoil to allow smoke to escape. Place pouch on one side of the barbeque. Ignite one side of the barbeque (same side as the soaked wood chips). Heat on low until the temp reaches 350F. When the woodchips start smoking, place the trout on a piece of aluminum foil on the opposite side of the heat. Close lid and cook for 20 min. 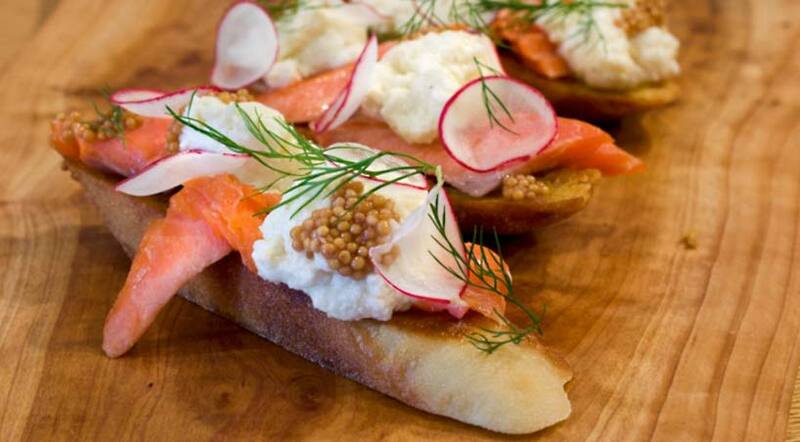 To finish, flake the trout into large pieces, spread ricotta mix over the baguette, and top with the flaked fish and sliced radishes. Enjoy! Make a pocket with the tin foil. Add soaked wood chips and close. Puncture holes in the tinfoil to allow smoke to escape. Build a small fire in the middle of the barbeque. After 10 minutes, push the coals to one side of the barbeque, creating an indirect cooking surface. Open vents half way on the bottom and on the lid. Place woodchips directly over the coals. Follow steps 5 to 7 from the Gas Method.